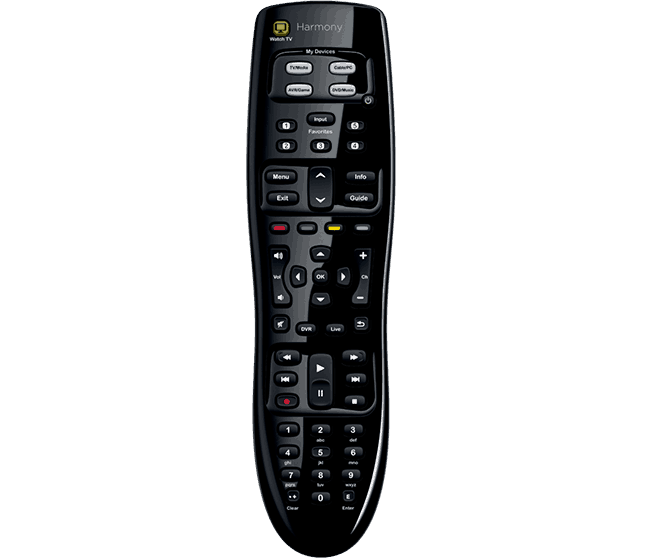 Comparing the Logitech Harmony 350 vs. 650 reveals two very well made and similar remotes. The primary differences between the Harmony 350 and 650 are the 350 only has one “activity” function (“watch TV”) while the 650 can be programmed with multiple activities and the 650 has an LCD screen while the Harmony 350 does not. If you just came here to get an answer…our top choice is the Harmony 650 (CLICK HERE for price). It is far better than the 350 and can be found online for almost the same price. You can also check out my comparison of Logitech’s high end models, the Harmony Elite and Ultimate here. 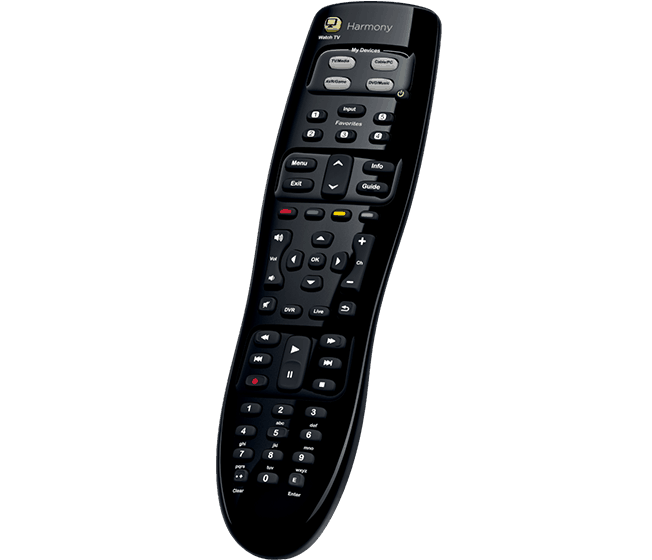 The Logitech Harmony 650 is a great, well made universal remote for the price. Often you can find it for sale considerably lower than it’s $79.99 MSRP. While it doesn’t have all the bells and whistles of the more high end Logitech models (like Harmony Hub connectivity or a companion smartphone app), it does have the features that make your life easier (such as one press activity buttons). It can get a little confusing when you compare it to the 655 and the 700, which is why I also wrote this guide explaining the differences between all three. 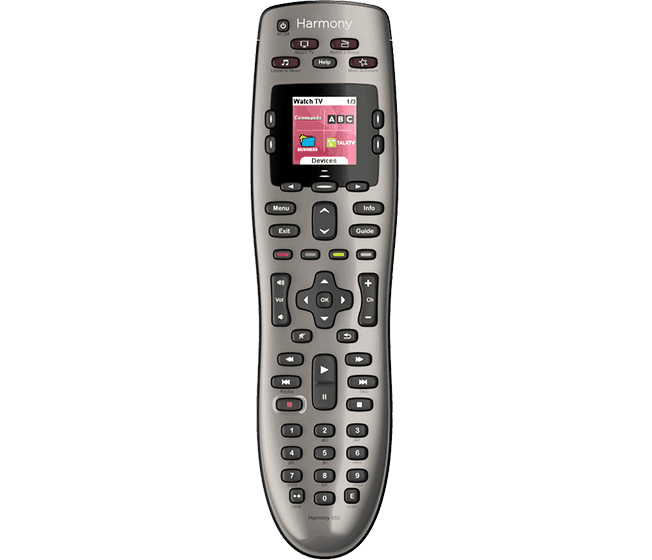 The Harmony 650 is laid out exactly how I would want a remote to be. 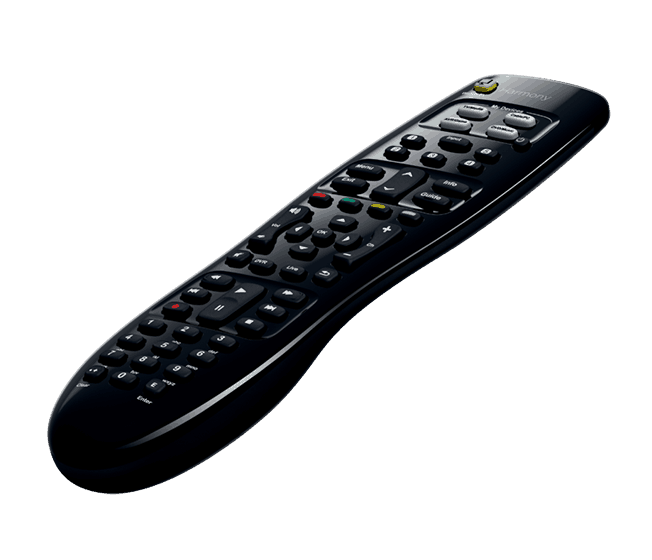 The frequently used buttons such as the directional pad, channel up/down, volume up/down, mute, and last channel are all right in the middle making them the easiest to access while you are holding the remote in your palm. This is an often overlooked ergonomic consideration. It also makes it easier to get to those buttons by feel without having to look at the remote. Perfect for turning up the volume without missing something. Then there are the playback buttons such as play, pause, fast forward, rewind, record, and stop just below. They are probably the next most important set of buttons so this is a great location for them. The numbers are higher up on the remote followed by the less used buttons (the LCD screen and the activity buttons that can be programmed to perform a sequence of button pushes to do things like turn on the TV, watch a movie, etc. Setup is pretty simple, just use the included USB to plug your remote into your computer and enter the manufacturer and model of each device you want to control. The Harmony 650 lets you set up sequences of commands. That means that you can use a single press of a button to turn on everything that you need for a particular activity such as watch TV, watch Apple TV, or play X-Box. One thing to keep in mind about battery life is that the LCD screen of the 650 will drain the battery faster than in the 350 (which has no LCD). If you are the kind of person that either forgets to charge rechargeable batteries or does not want to replace batteries as often, then you may want to consider the Harmony 350. Unfortunately, the Harmony 650 does not connect to any smart home devices. It only uses infrared to control the devices and does not have the capability to connect the the harmony hub. The 650 can control just about any device that uses infrared control. According to the Logtiech website, it can control over 6000 brands. The Harmony 650 has a limited feature set but what is does…it does very well. I think it benefits from the fact that Logitech invests a lot into making its flagship models user friendly and ergonomic as a lot of that has trickled down to the less expensive models. Overall, I would recommend this remote. Lack of smart home connectivity or Harmony Hub connectivity means this probably wouldn’t be your first choice. But for the budget conscious who don’t need those features it is a fantastic choice. It is also a great option for a secondary room that doesn’t have a complex home theater setup. The Harmony 350 is the budget model of the Harmony lineup. Although it possesses the same attention to ergonomics and quality found in the other models, there are some significant functionality shortcomings that would prevent me from recommending it to most people. The layout of the Harmony 350 is relatively similar to the Harmony 650, although it lacks some of the buttons found on the 650. 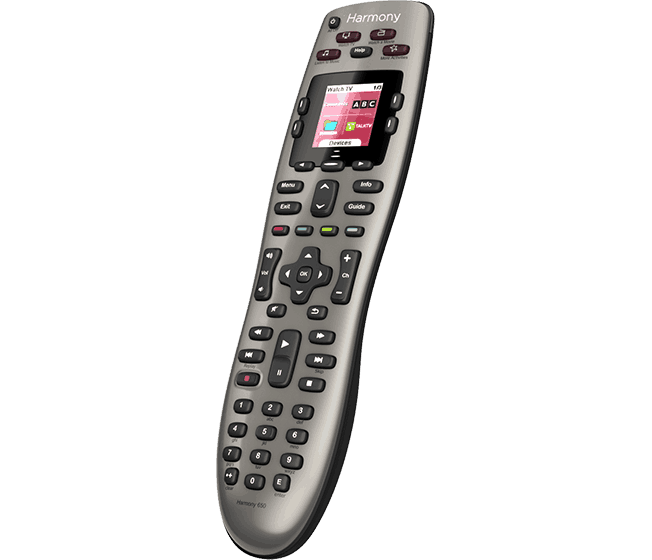 The biggest shortcoming of the Harmony 350 is that it only contains a single function or macro button. It has a “Watch TV” button that will run a sequences of commands that will turn on all the devices necessary to watch TV. However, unlike the higher end Harmony remotes, it will not switch inputs for devices such as the TV or receiver to maks sure that all of them are set correctly. Having only one such button also means that you can’t set other functions, such as watch Blu Ray or play X-Box. Those will have to be done manually. To me, being able to press one button and have the remote programmed to make all the necessary changes to do a specific thing is the biggest benefit of having a universal remote. The 350 also lacks a touch screen which explains the lack of other macro buttons as the touch screen is where those are found on other remotes. Just like the 650, you’ll just need the manufacturer and model number of every device that you want to control. Then you will plug the remote into your computer via USB and enter that information into the logitech setup webpage. The battery situation for the Harmony 350 is the same as the 650. It requires two (2) AA batteries. Just like the Harmony 650, the 350 does not have any smart home connectivity. Same as the Harmony 650, the 350 can control over 6000 brands of devices (pretty much any major brand device that uses infrared). Overall the Harmony 350 left me mostly disappointed. The lack of macro functions and lack of a touch screen means this device is not much better than the really inexpensive ones you can get at any store. I get that Logitech wanted to have a budget model in their lineup but it just doesn’t fit in with the other remotes. Well, no one really. But if I was hard pressed to find a reason to choose the Harmony 350…it would probably be the fact that battery life would be better without the touch screen. So if that is really important to you, then the Harmony 350 might be your pick. The choice here is pretty easy. The Logitech Harmony 650 is the clear winner here. 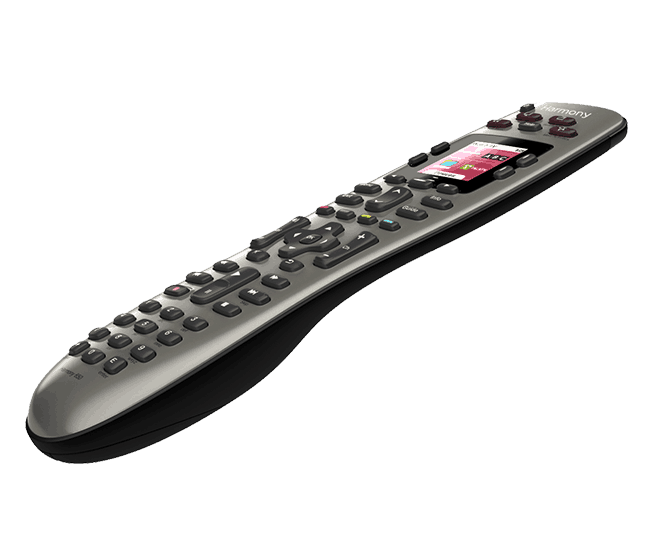 The 350 falls short by lacking most of the important functionality that you would want in a universal remote. On top of that, the Harmony 650 can be found well below the MSRP at prices pretty close to the 350, so there is really no reason to buy a 350, unless you really hate having a touch screen and want to maximize your battery life.